On a national level, the America Creating Opportunities to Meaningfully Promote Excellence in Technology, Education, and Science (COMPETES) Act was enacted in 2008 and reauthorized in 2010. America COMPETES articulates the need for increased national attention to science, technology, engineering, and mathematics (STEM) education, research, and development. Alabama has long recognized the economic importance of encouraging growth in targeted STEM research areas. 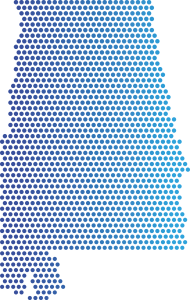 Initially, the 2009 Alabama Science and Technology Roadmap was developed to guide leaders in the public and private sector to ensure the growth of a strong science and technology foundation in Alabama. The 2009 Roadmap identified core technology assests in the state and called for enhancing state and private support for “applying core technologies more extensively to promote innovation and global competitiveness for Alabama’s key industries, such as automotive, aerospace, healthcare, agriculture, forest products and advanced manufacturing.” This was followed by the development of a more advanced economic development strategic plan for the State, Accelerate Alabama, led by the Economic Development Alliance, created in July 2011 by Executive Order of Governor Robert Bentley and Chaired by Alabama Department of Commerce Secretary Greg Canfield. Accelerate Alabama includes eleven identified targeted business sectors for Alabama to focus its efforts, as well as recommendations or accelerators, and related tactics, centered on three economic development drivers: Recruitment of new business and industry, Retention and expansion of existing business and industry and Renewal through job creation, innovation, research and development, as well as commercialization. 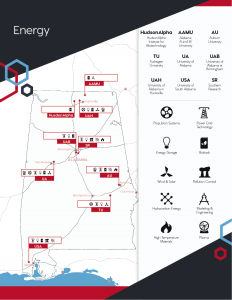 In coordination and in support of the Accelerate Alabama economic development strategic plan, Alabama EPSCoR (ALEPSCoR) has developed the ALEPSCoR State Science and Technology Roadmap (AESSTR). AESSTR was crafted in consultation with the research leaders of the seven Ph.D. granting institutions of the State, representatives from the Alabama Department of Commerce, the Economic Development Partnership of Alabama (EDPA) and with input from several research oriented companies such as the Hudson Alpha Institute for Biotechnology and Southern Research. The Roadmap complements Accelerate Alabama by identifying statewide research priorities and areas of research expertise across Alabama’s universities and laboratories that can provide the targeted economic growth. The AESSTR will be regularly updated to reflect evolving research priorities and new areas of research expertise. The AESSTR calls for partnership between the research and education enterprise of Alabama’s universities and economic growth in the state. It describes a pathway for utilizing the skills and resources at Alabama’s universities with private and public laboratories to achieve the goals of statewide Renewal of industry through the growth of innovation and research and development activities directly related to the expertise and strength of Alabama’s universities and laboratories. Alabama has a long history in agriculture, chemistry, forestry, manufacturing and transportation. More recently other domains, including biosciences, informatics technology, space sciences, energy, plasma science, information science, and nanotechnology have emerged. A strategic, forward-thinking Alabama can take advantage of these emerging domains of strength to build a thriving, diverse economy. The AESSTR provides the mechanism for Alabama to capitalize on the inherent strengths of its institutions of higher education to bring a Renewal to the state, building an environment where science, technology, and the economy grow alongside the intellectual and business opportunities of the future. Research expertise and capabilities data collected from Alabama’s major research institutions have been separated into eleven Primary Target categories: Agricultural Products/Food Production, Biosciences/Biotechnology, Chemical/Petrochemical, Forestry Products, Metal and Advanced Materials, Advanced Manufacturing, Plasma Science, Informatics Technology and Cybersecurity, Energy, Nanotechnology, and Transportation. Given their extensive existing infrastructures and tradition of engagement, Alabama’s research institutions are poised to play an ever increasing role in fostering the state’s flourishing knowledge-based economy through strategic public/private sector interactions. Collectively, we are working to build stronger and better-informed collaborative relationships through extensive engagement with economic developers, civic leaders, state agencies, Chambers of Commerce professionals, and other professional organizations across the region with improved economic development as our goal. On September 9th, 2016, following a presentation from Dr. Gregory Fitch of the Alabama Commission on Higher Education explaining the necessity for responsible stewardship of scientific resources to benefit students and institutions, ALEPSCoR Steering Committee Chair Mrs. Lynne Chronister presented the AESSTR to the Alabama Commission on Higher Education (ACHE). Detailing the value of a partnership between the research and education enterprise of Alabama’s universities and economic growth in the state, Mrs. Chronister described a pathway for leveraging the resources at Alabama’s universities with private and public laboratories to achieve the goals of statewide Renewal of industry through the growth of innovation and research activities directly related to the expertise and strength of Alabama’s universities and laboratories. As Mrs. Chronister noted, the AESSTR provides the mechanism for Alabama to capitalize on the inherent strengths of its institutions of higher education, to bring renewal to the state, and to build an environment where science, technology, and the economy grow alongside intellectual and commercial opportunities. In order to further explore the opportunities for updating and implementing the AESSTR, a workshop was hosted by ALEPSCoR on November 11, 2016 and included the Secretary of Commerce Greg Canfield, the Alabama VPRs, EDPA, ACHE, and several industrial representatives. A pdf of the Workshop agenda can be found here.